I'm very happy to be part of Trixi's sew a softie - valentines this year. 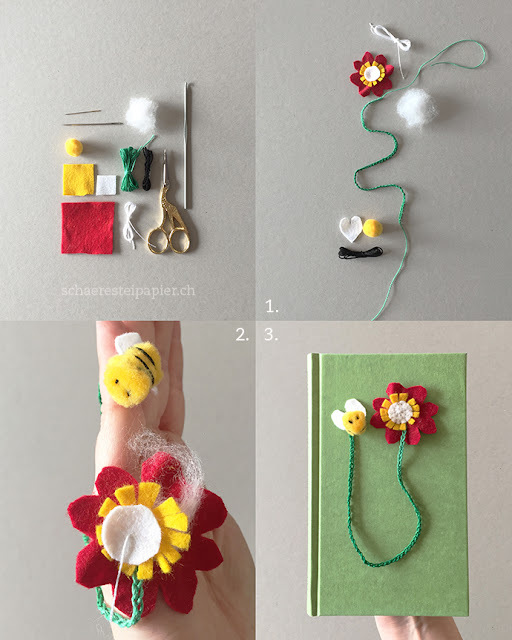 Here is my contribution to it: Three easy bookmarks with hearts, flowers and a tiny bee. You can use small pieces of colourful felt and twine and crochet thread. Mix whatever you like and try free stitches. If you don't want to crochet, use a small silk ribbon instead. 1. Download and print out the template and cut out the 5 hearts. 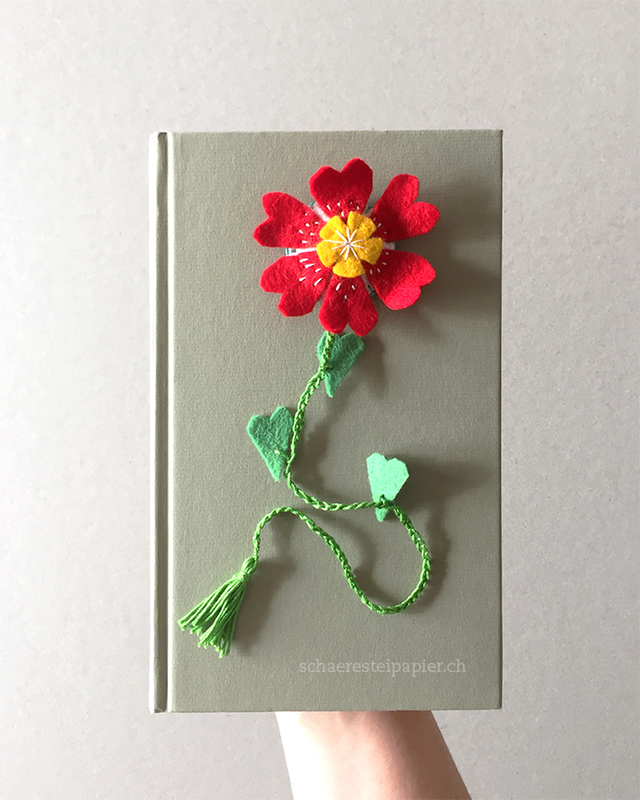 Crochet the string as long as most of your books are. Leave the thread at both ends long, so that you can make easy knots or stich with it. 2. 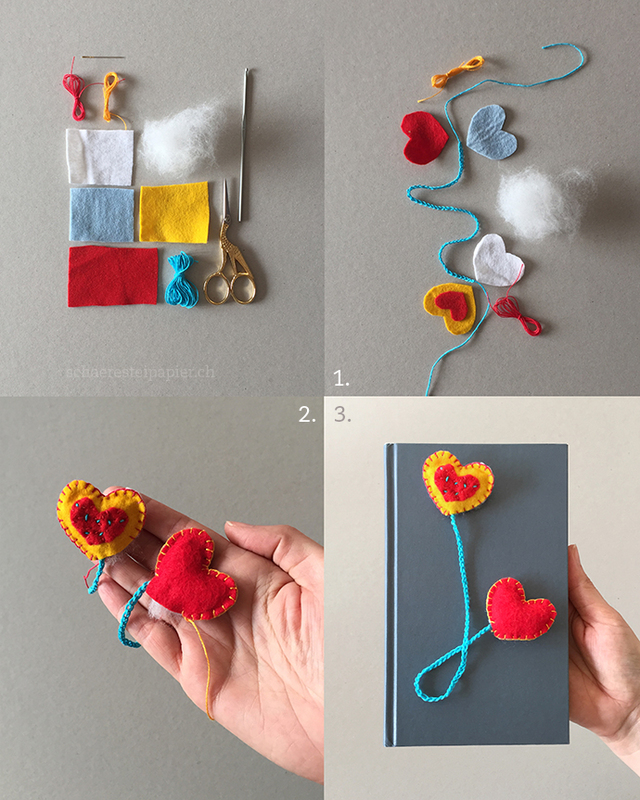 Sew the smaller heart to a bigger one. Sew the cord on the insides of two hearts. 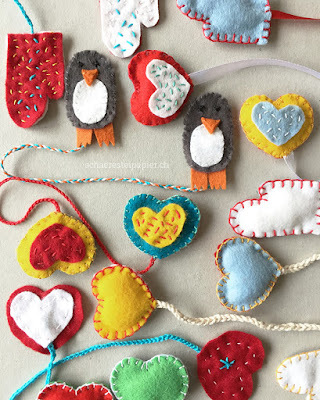 Sew two hearts together, leave them open as wide as a finger and fill the hearts with fiber. 3. Close them and ready is your first bookmark! 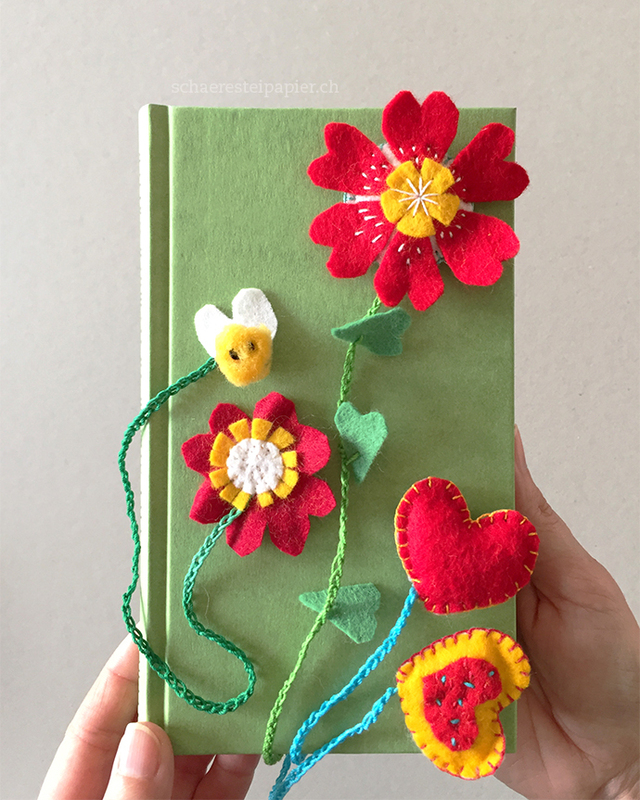 There is a flower and on the other side, there is a tiny bee, made from a pompom. There are hearts hidden: Four of them make the flower petals and the wings have a heartshape as well. 1. Download and print out the template and cut out the flower parts and wings. Crochet the string as long as most of your books are. Leave the thread at both ends long, so that you can make easy knots. 2. 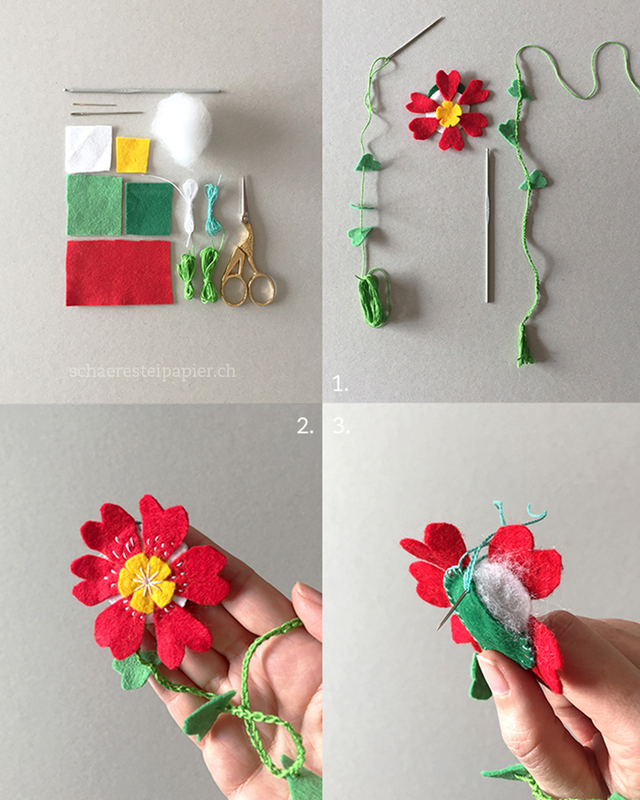 Add the smaller parts of the flower on the petals middle. Twist the fiber and turn it round beneath the yellow felt. Stitch the parts together. Sew the cord on the backsite of it. Sew the wings to the yellow pompom, add eyes and stripes. Knot it to the cord. 3. 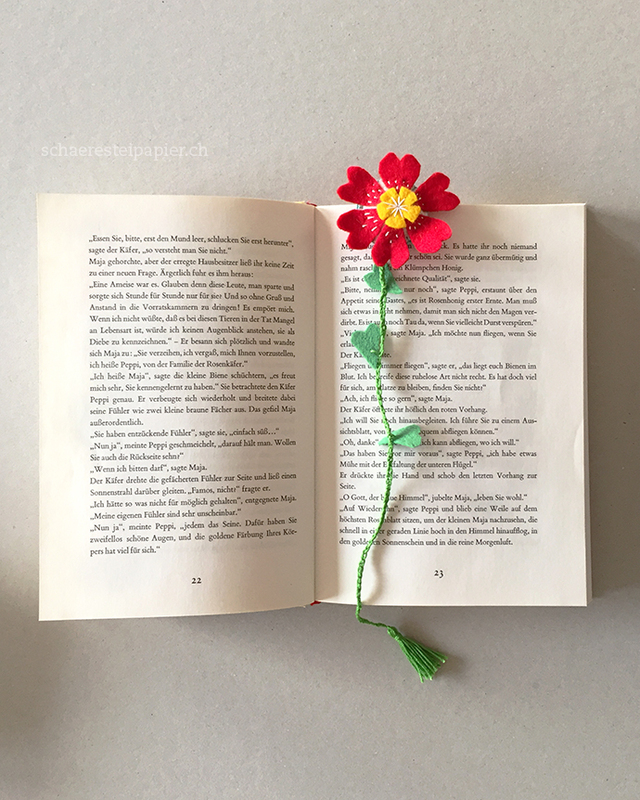 Your second bookmark is ready! 1. Download and print out the template and cut out the circles and hearts. Add the green leaves to the thread before you crochet the string. Leave the thread at both ends long, so that you can make easy knots or stich with it. Wound up some yarn around two fingers, knot it to cord and form and cut a tassel. That will be the root. 2. Sew the 6 hearts to the white circle. Add the yellow circle and sew it. Knot the cord on the insides of the circle. Sew the two circles together, leave them open as wide as a finger and fill it with fiber. Close them and ready is your third bookmark! Your bookmarks are adorable! Especially love your flower with the tassel root!! 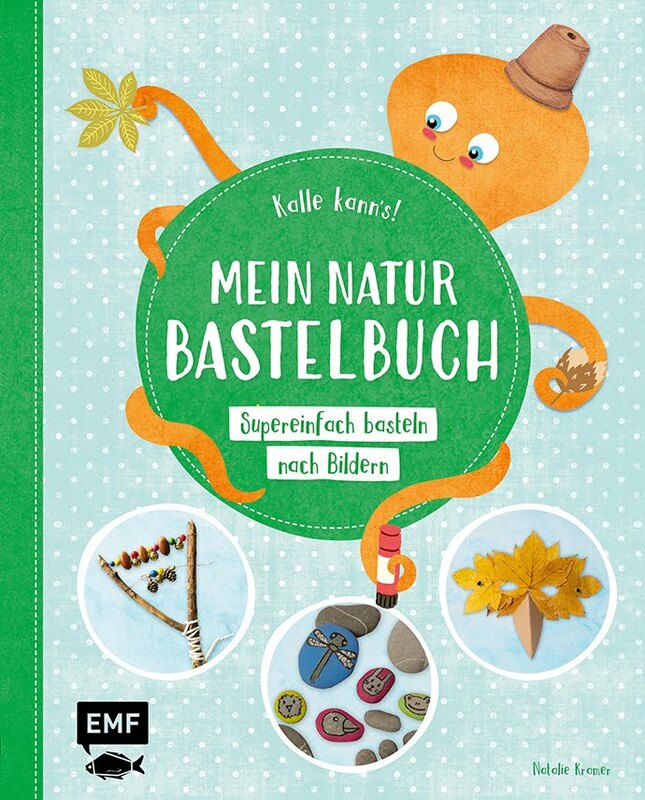 So wunderhübsche Buchzeichen! Die Herzblume gefällt mir sehr! 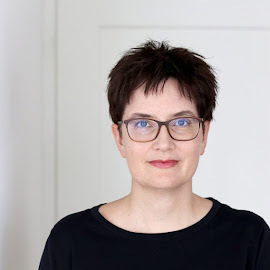 Liebe Natalie, die Lesezeichen sind bezaubernd. Die teile ich gleich bei Facebook.